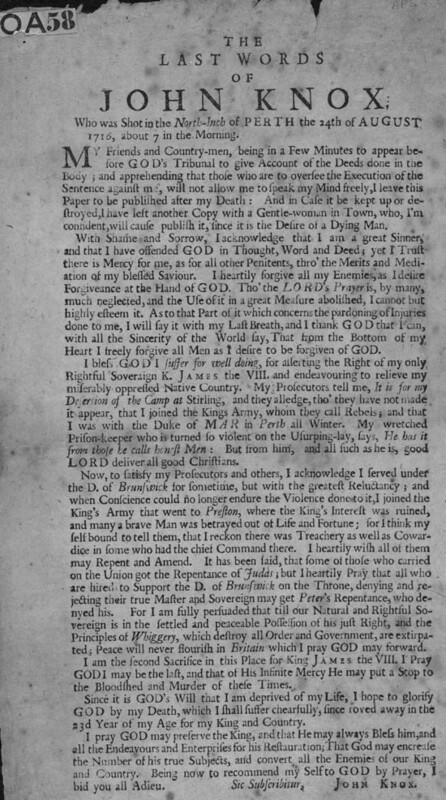 This broadside begins: 'THE LAST WORDS OF JOHN KNOX / Who was Shot in the North-Inch of PERTH the 24th of AUGUST 1716, about 7 in the morning.' No publication details have been included on this sheet. Apparently no relation to the famous Scottish Protestant reformer, John Knox (1505?-72), this particular John Knox nevertheless chooses to take the religious and moralistic high ground in his dying speech. Rather than being a supporter of the Protestant faith, however, his allegiance to the Church of Rome is clear through his support for the 'only Rightful Soveraign [sic] K. JAMES the VIII', otherwise known as James Edward Stuart or the 'Old Pretender'.